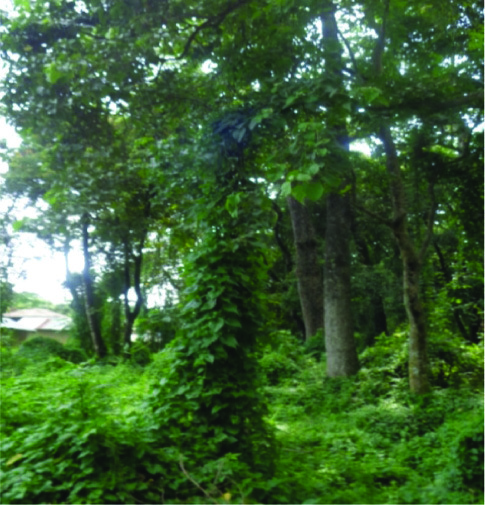 Differences in governance relationships and community efforts to remove an exotic, rapidly spreading invasive plant, the-mile-a-minute weed (Mikania micrantha), are explored in five case study community forests in the subtropical region of Chitwan, Nepal. An institutional analysis informs an examination of the de jure (formal) versus de facto (on the ground) institutions and actor relationships relevant to Mikania removal efforts. Contrary to the expectations set by the de jure situation, we find heterogeneous governance relationships and norms related to Mikania management across community forests. Content analysis of interview data illuminates reoccurring themes and their implications for social and ecological outcomes in the communities. Complex governance relationships and regular discussion of distrust of government and non-government officials help explain collective action efforts and management decisions. The content analysis suggests that Mikania is impacting people’s daily lives but the degree of severity and the response to the disruption varies substantially and is heavily affected by other problems experienced by community forest members. Our results indicate that understanding how the de facto, or on the ground situation, differs from the de jure institutions may be vital in structuring successful efforts to manage invasive species and understanding collective action problems related to other social-ecological threats. We present data-informed propositions about common pool resource management and invasive species. This study contributes to a better scientific understanding of how institutions mediate social-ecological challenges influencing common pool resources more broadly. Chitwan is a rapidly urbanizing district in Nepal’s subtropical Terai region containing the internationally-important Chitwan National Park. Chitwan National Park was founded as Nepal’s first national park in 1973 (Straede and Helles 2000) and is home to high-profile species such as the Bengal tiger and one-horned rhinoceros. The park’s area is approximately 932 square kilometers (Nepal and Weber 1994) and in 1996 a formally recognized buffer zone of approximately 750 square kilometers surrounding the park was created (Straede and Treue 2006). The purpose of establishing the buffer zone was to decrease the impact of human activity on the park ecosystem by creating rules on resource collection and use for people who live in these areas (Nepal and Weber 1994). Human impacts on the park are substantial: it is heavily visited, having hosted 115,181 visitors in fiscal year 2009–2010 (Pandit et al. 2015). Furthermore, the buffer zone area saw a net decrease of 62 square kilometers of forest and a net increase of 67 square kilometers of agricultural land between 1978 and 1999 (Baidya et al. 2010). Community forestry is a type of decentralized, local forest resource governance system. Community forest user groups were formally established in Nepal in 1993 through the Forest Act and were designed to address the challenges of people, natural resources, and protected areas (Iversen et al. 2006; also see Gilmour 2003 for an overview of community forestry and associated policies in Nepal). In the mid-1990s, Chitwan gained its first formally-recognized community forests, most in the buffer zone. These community forests provided residents opportunities to collect forest products and timber in forests that are largely self-governed. The community forestry program also intended to reduce people’s reliance on often illegally harvested forest resources within the national park, while simultaneously supporting livelihoods through sustainable management of the buffer zone forests. However, novel social-ecological changes such as increasing rates of urbanization and biological invasions now threaten the success of the community forestry program in increasing and maintaining forest health. This research explores how institutions influence community forest members’ collective efforts to manage a rapidly spreading invasive plant, known informally as the mile-a-minute weed (Mikania micrantha: hereafter referred to as Mikania), that is disrupting social-ecological processes in this region. Institutions are defined in this research as the shared rules, norms, and strategies that shape human decision making and are inherently intertwined in efforts to govern common pool resources, such as community forests (Ostrom 2005). With this research, we address a gap in analyses of community forestry outcomes (Lachapelle et al. 2004; Charnley and Poe 2007) by elucidating the impacts of governance relationships, or their absence, on collective action in a common pool resource facing social-ecological changes. Thus, our study contributes to scientific understanding of the relationship between institutional diversity and management efforts and illuminates the importance of learning the on-the-ground conditions, as opposed to solely studying the formal institutional situation. This research has practical significance as the findings can improve collective natural resource management, leading to enhanced efforts to mitigate the negative impacts of invasive species on ecologically significant species and socially and economically important protected areas. Mikaniamicrantha is a fast-growing plant native to South America that favors humid, warm (tropical and subtropical) environments (Figure 1). Mikania is believed to have been intentionally transferred to India and the Pacific Islands around the 1940s for use as a cover crop for airfields (IUCN 2005). Since then it has negatively impacted agricultural and forest resources in parts of India, China, and Nepal, among other regions. Mikania spreads rapidly across landscapes through both vegetative growth from dropped stems and wind-borne seeds; it is fire-adapted and contains allelopathic compounds in its roots that inhibit growth of other plants. Household resource collection activities often result in unintentional exacerbation of Mikania. Mikania is often entangled in collected grasses and grows where pieces are dropped along resource collection routes. For these reasons, it has proved to be extremely difficult to eradicate. In Chitwan, Mikania was present in 20% of Chitwan National Park in 2010 (Khadka 2010) but the buffer zone community forests have been invaded to differing degrees of severity (Clark et al. 2016). Recent work has shown that Mikania invasion causes significant ecological harm to local resources, including food and habitat for the vulnerable one-horned rhinoceros (Ram 2008; Murphy et al. 2013). By covering and killing vegetation, Mikania further represents a threat to the livelihoods of Chitwan households that are dependent on collecting grasses and fodder (Rai and Scarborough 2015). Many invasive plants globally have become useful to local communities after their invasion. Unfortunately, Mikania is not a viable substitute for the grasses it covers, which are often used to feed livestock by many Chitwan households, as Mikania is indigestible to most livestock. Mikania micrantha climbing a tree in Chitwan. (Photo by the authors). Previous research and the fieldwork discussed in this article have found that efforts to manage Mikania in the buffer zone community forests have been largely unsuccessful (Murphy et al. 2013). When referring to “Mikania management,” we mean efforts by actors to address the Mikania invasion, primarily involving different removal attempts and discussion of or planning for such efforts. Removal attempts often include pulling, cutting, or burning the plant. In addition to studying the ecological and biological aspects of the forests and Mikania (see Clark et al. 2016), to strengthen Mikania management, researchers and stakeholders need a clear understanding of the governance relationships across the buffer zone community forests. Without information about the actors involved in Mikania management efforts on the ground, stakeholders will continue to lack the information necessary to successfully design or influence collective Mikania management efforts in Chitwan and elsewhere. We use the term de jure (“by law”) to reflect the actors hypothetically involved in Mikania management in the buffer zone, or the situation as it formally exists via laws, policies, and records. We use the term de facto (“in fact”) to reflect the actors presently involved in Mikania management, determined via our fieldwork. To understand the de facto situation, we employ case studies in five community forests to explore the connections between the perceived effects of Mikania on livelihoods, the diversity in current Mikania management practices, and the relationship between these factors and existing institutions and governance relationships. The term “governance relationship” refers to interactions between different actors (including government agencies at different levels, non-governmental organizations, community forest governance officials, and local community members) involved in a collective issue that results in the creation or reinforcement of institutions (Hufty 2011). Based upon the de jure institutional arrangements, what actors should be involved in Mikania management and what does Mikania management resemble de facto, or on the ground? How do norms alter the de jure institutional arrangements and influence community forest user groups’ collective Mikania management activities? What lessons can we learn from this case study of Mikania management to inform the role of institutions in mediating collective action problems involving social-ecological challenges? Recent research from around the globe has focused on the various factors that lead to successful community forestry outcomes, including common property management, power dynamics, and accountability (Agrawal and Chhatre 2006; Behera and Engel 2006). Despite this prior work in Nepal (Varughese and Ostrom 2001; Poteete and Ostrom 2004; Ojha 2006; Ojha et al. 2009), little is known about how different governance relationships between community forestry groups may mediate social-ecological challenges like invasive species management (Epanchin-Niell et al. 2009) or what this means for how institutional analysis may be most effectively conducted (i.e. studying the on the ground situation versus the formal situation). Community forestry often introduces decentralized, democratic governance where people within a given community contribute to decision making processes (Lachapelle et al. 2004). However, heterogeneity exists among institutions; some community forests target specific groups (including women or disadvantaged caste and ethnic groups) in an effort to right long-enduring discrimination, inequality, and injustice, and there are substantial differences in community forest management practices or goals. Different institutional arrangements within Nepal appear to reflect underlying heterogeneity of the communities including the variation in biophysical condition of the forest (forest degradation/forest health), dominant labor occupation (community dependence on the forest resources and employment opportunities in nearby markets), and community dynamics and population size (Acharya 2002). Heterogeneity related to governance practices and management norms often exists within community forests in the same geographic region. Heterogeneity in caste, education, gender, and other factors influence which households benefit the most from community forestry and who participates in collective resource management (Adhikari 2005). Contrary to previous studies, richer households with land holdings, livestock, and more monetary resources are sometimes more dependent on community forest resources than poorer households, and thus are in a better position to benefit from intermediate forest products (Gilmour et al. 2004; Adhikari 2005). The role of heterogeneity in collective management of common pool resources has been hotly debated in the literature (Varughese and Ostrom 2001). Heterogeneity here refers to differences that might impact the success of reaching a collective goal. Kant (2000) defined this heterogeneity in three levels: (1) if there are social, cultural, and economic differences between people living in the same area using the same resources, there are likely to be (2) different preferences for using the resources and (3) different preferences for management. Thus, heterogeneity hypothetically can pose difficulties in successful collective action to manage a common pool resource (Ostrom 2005). Ostrom (2005) argues that the focus on heterogeneity has been misplaced; instead the focus should be on the factors affecting differences in heterogeneity, such as the governance relationships, and interactions between factors. One factor that may influence heterogeneity in collective efforts to manage Mikania is trust between actors, such as community forest members, NGOs, and the national park. The idea that trust may influence heterogeneity is intuitive in common pool resource management, but there is a dearth of empirical and systematic studies of trust in the common pool resource literature (Ostrom 2010). Our analysis will contribute a systematic exploration of the role of trust in Mikania management efforts in Chitwan. Chitwan community forests formally have homogeneous structures: to be recognized by the government, they must create management and governance plans that are reviewed by the district forest office or, if the community forest borders the national park (as in all of our case studies), the plans are reviewed by the park office. These two offices have similar requirements, and thus the organizations have created formally homogenous structures in the community forests in this area. Local community forest members are part of a community forest user group and each community forest has a locally elected governance committee, typically consisting of ten to fifteen members. Households are eligible to join an established user group based on their location within a community forest’s catchment area. These catchment areas are administrative boundaries that are determined by district and local level government (the latter known as the Village Development Committee). The community forest governance committees are responsible for carrying out rules and policies outlined in their own forest management plans. These plans can be altered by the governance committees, but they are largely similar across community forests and include policies such as fees (if any) for grass and fodder collection; membership fee structures; rules for removal of resources such as fuelwood and timber (which is typically prohibited due to the general scarcity of harvest-ready trees); and possible sanctions for violating resource collection or use rules. Community forest members are informed of their committee’s policies when they join and are responsible for upholding the policies outlined in the management plan as well as informal norms such as aiding in activities like annual forest cleaning where trash is collected. Based on our fieldwork including a 2014 household survey of 21 community forests in the buffer zone, membership of eligible households ranges from 38% in forests near urban areas to 93% elsewhere; over 80% of buffer zone households engage in some form of agriculture and thus many rely on the forest resources. Forest resources include grasses fed to dairy animals, like cows and buffalo, that are essential to agricultural households; these animals provide manure for crop fertilization and power for running agricultural machinery. Table 1 provides an overview of household characteristics for the five community forests presented as case studies in this article (see the methods section), and average measures for all 21 buffer zone communities for comparison. HH, household; CF, community forest; CFGC, community forest governance committee; USD, United States dollars. Survey was conducted in late 2014, response rate was 98%; the ethnographic fieldwork was conducted in mid-2014 and partially informed the survey. It is important to understand institutions as they exist formally, but entirely different and equally essential to understand how they operate in practice, the “rules in use” (Ostrom et al. 1994; Ostrom 2005, 186). Formally, as defined in forest management plans, the buffer zone community forest rules are very similar due to the aforementioned management plan procedures. Figure 2 details the actors that hypothetically, de jure, would be involved in some aspect of Mikania management based on forestry acts or Nepal’s government structure. Our analysis will explore how the de facto situation, the way institutions are operationalized, differs from the de jure situation depicted in Figure 2 and why this matters. We ultimately contribute three propositions based on our finding that the situations differ significantly – connecting governance relationships, common pool resources, and invasive plants – which lend insight into the role of institutions in mediating social-ecological challenges more generally. Governance relationships involved in Mikania management in the buffer zone community forests in the de jure situation. Darker grey circles are local level actors, while lighter grey circles represent district or national level actors (non-governmental organizations – NGOs – are both). Using data from five case study community forests, we explore the relationship between governance, institutions, and invasive species management. We investigate the role of institutions as mediators of shocks and disruptive events that threaten community sustainability (Leach et al. 2010). In our setting, these disruptions take the form of invasive plants as a threat to the social-ecological system. Institutions evolve over time and adapt to the social, political, economic, and ecological context in which they are embedded. When there are slow or gradual changes in this context, there is time and flexibility for institutions and relationships to successfully adapt. Abrupt shocks, such as rapidly spreading invasive species, challenge these relationships and their sustainability (Young et al. 2006). Distinct from much community forestry literature, our focus is not on understanding collective action to establish community forestry programs (Varughese and Ostrom 2001; Poteete and Ostrom 2004), but rather on collectively acting to manage the forest in the face of potentially catastrophic social-ecological challenges like Mikania. An understanding of collective action on the ground is important for confronting such common pool resource threats (Ostrom 2005). Five community forests were selected for household and management committee interviews from a group of 11 buffer zone community forests where ecological data, including Mikania distribution, was collected in 2013. To select case studies, we first created a preliminary “governance capacity” index (high, medium, or low) based upon historical data related to community forest income (government funds and money community forest governance committees raised via selling resources such as gravel to the government or tourist entry fees) and the community forest’s age (time since establishment). The total amount of income available to a governance committee critically influences the community forest-related and social services the committee can provide for its members. For example, wealthier governance committees are able to hire guards to ensure forest resource collection rules are enforced, and they additionally often support other social services such as local schools and infrastructure improvements (like roads). The stratification process in our case selection ensured cases included a mixture of historically high, medium, and low governance capacities. After classifying all community forests, we used a random number generator to assign numbers to each case. The community forests corresponding to the two largest values in the high and low categories, and the largest value in the medium category, were selected. We adopted this methodology to reduce any personal biases (such as personal experience or learned information about specific communities) in selecting our cases and to increase the likelihood of variation in governance capacities. The five community forests in this research are identified by pseudonyms (the names of rivers in Nepal) because some of the information discussed is sensitive to these small communities. In total we conducted 29 semi-structured small-group interviews with 87 interviewees between May and July 2014. Our method is the most appropriate way to understand the rules in use, as we are able to collect richer, more nuanced information than with other methods such as surveys. Five interviews were conducted in each community forest, which each included between two and ten participants. The remaining interviews took place in Chitwan National Park, two non-governmental organizations, and the buffer zone committee office. All interviews were between one and two hours in length. These interviews included questions covering interactions with a variety of individuals and organizations, Mikania management, and perceptions of Mikania; the semi-structured nature also allowed participants to discuss emergent topics (Bernard 2011). Before interviewing, the protocol was translated to Nepali by a native Nepali speaker and tested with several community members at the Institute for Social and Economic Research-Nepal (ISER-N) in Chitwan. Some concepts, such as “invasive species” do not directly translate or have a meaning in Nepali. As such, translations were made to best approximate the intended meaning in English. Fieldwork additionally consisted of participant observation (of activities such as fodder collection) between and during interviews to more fully understand the contexts of the responses. To explore governance relationships, we interviewed community forest members, the five governance committee presidents, Chitwan National Park officials, buffer zone committee officials, and officials from two non-governmental organizations. Figure 2 presented the de jure conceptual representation of the actors. The buffer-zone community forests are connected to the buffer zone committee, which generally acts as a mediator between the community forest governance committees and the national park. Most of the community forests in Chitwan are registered with either the district forest or Chitwan National Park; all of our case study forests except one were registered with Chitwan National Park (the remaining community forest was restricting resource collection due to poor forest health and intended to register with the park in the future). The interviewee composition was representative of the ethnic composition and educational status of each of the community forests. It is possible that higher caste Hindus were underrepresented in the interviews and females were overrepresented. We under-represented young women (18–21 years) who were less likely to participate in an interview with males or older females present; additionally, there were fewer young men, as many were working overseas. We were able to interview both farmers and non-farmers, but it was very difficult to find people that did not farm in some capacity. Interviews with two non-governmental organizations consisted of representatives from NGO A and NGO B (pseudonyms), both working in Chitwan and with some of the case studies. These non-governmental organizations are both conservation oriented and provide services to local households, such as wildlife and plant identification classes and habitat management information (for example, wetland management). Each non-governmental organization has worked with some local households on invasive plant management. Content analysis, also sometimes referred to as theme analysis, is a systematic text analysis method common in anthropology that is applicable in any research with text data. Content analysis can be both deductive, where the analyst begins with a hypothesis or an idea from the literature that they seek to assess, or inductive where codes stem from fieldwork and intimate knowledge of the data (Bernard 2011). Content analysis can be quantitative or qualitative in nature. Some of our codes are quantitatively presented as percentages while others are discussed qualitatively in the context of participant observation notes or an entire interview. The codebook was developed according to best practices established by MacQueen et al. (1998). Two independent coders went through the codes together and calculated inter-rater reliability for each code in five interviews. Inter-rater reliability is a measure of agreement among coders; if all coders coded every instance of a code the same, the Cohen’s kappa (the standard inter-rater reliability statistic of agreement) for that code would equal one, whereas if every instance was coded differently, Kappa would equal zero. In order to resolve codes where an initial kappa of 0.7 or greater was not achieved, we discussed the codes for clarification and re-coded (MacQueen et al. 1998). Content and institutional analyses are natural complements for text data that explores governance relationships, as themes can be interpreted in the context of governance relationships. There are a wide variety of approaches to institutional analysis, but in many cases the Institutional Analysis and Development framework provides a background to the interpretation of existing strategies, norms, and rules (Ostrom 2011). Here, we focus on the actors and the action situation within the framework (Figure 3) to explore linkages between governance relationships. There are a variety of actors interacting with community forest user groups in some manner. The linkages between these actors, including the frequency and strength, are distinct in the five case studies. Coding the interview data for the presence of these relationships aided in clarifying them, but initial diagrams of governance relationships and norms of interactions were created during fieldwork for each case. The institutional analysis examines the text and participant observation notes for the relationships between the participants potentially involved in the action arena focused on Mikania management presented in Figures 2 and 3. These relationships impact how information about Mikania is communicated and will be discussed qualitatively in the context of the information from the content analysis. Future research will elaborate on other areas of the framework in Figure 3, including linking biophysical conditions of the forests to the action situation and related outcomes. The Institutional Analysis and Development Framework, adapted from Ostrom et al. (1994). Based on the similarity of most community forest management plans, we anticipated that the community forests would be similar in multiple aspects. In actuality, we discovered that across the five community forests heterogeneity in governance was the norm and that the de facto governance relationships (Figure 4) differ from the de jure situation (Figure 2). There is variation in the concern about Mikania, perceived extent and spread of Mikania within the forests, the physical methods used to manage Mikania, and organization of community members involved in management. Variation also exists in the major problems identified by each case study: invasive species, human-wildlife conflict, flooding, forest degradation, and pollution. There is substantial variation in community forest collaboration with outside entities, specifically non-governmental organizations and the national park. Next, we elaborate on these variations and expand upon the importance and impact of this heterogeneity. Governance relationships involved in Mikania management in the buffer zone community forests in the de facto situation. Faded circles and lines (the lightest grey) represent actors and relationships formally present that do not exist, or are significantly weaker, in practice. Most interviewees in all five communities believed that Mikania was increasing in abundance, while some thought Mikania presence in their forest was the same when compared to the previous year (Figure 5). Interviewees in Trishuli, Koshi, and Gandaki (particularly women, who are responsible for most resource collection) expressed that Mikania was impacting how they allotted their daily time, by making collection of forest resources such as grasses and fodder increasingly difficult. Interviewees in all five communities articulated that increasing Mikania abundance limits food sources for wildlife, resulting in additional large fauna (tigers, rhinos, boar) leaving the forest in search of food. There was substantial variation in the problems discussed by interviewees (Table 2). All interviewees were asked about flooding, issues experienced with wildlife (crop destruction, attacks, or related), invasive species, and the condition of community forest resources. Industrial pollution was mentioned without prompting in Gandaki; in this case three interviewees discussed an industrial factory that had discharged an unknown substance onto their field. Major problems identified in each community forest. Interviewees from all communities discussed a lack of forest resources in some capacity, but in Koshi resource collection was prohibited (except for one collection day per month) due to forest health and wildlife conflict (rhino attacks). In Koshi, the Nepal Army was stationed at entrances and within the forest in an attempt to prevent and protect people from rhino attacks (the Nepal Army only provides guards to the community forests in severe cases where the governance committee has requested them through the buffer zone committee, who then contacts the national park where a request is typically placed with the district level government). Mikania as a problem was discussed by interviewees from every community forest, but only in Ghaghara and Trishuli was it perceived as a chief concern. In these communities Mikania was identified as directly affecting livelihoods by increasing the time and distance to collect forest products. All of the case study communities discussed invasive plant species and Mikania within their forests, but there was variation in the level of concern. As noted, Ghaghara and Trishuli were the most concerned about Mikania (Table 2; Tamur and Koshi perceived Mikania as a medium level threat and Gandaki a low level threat). Interviewees discussed its impact on the time it took to collect grasses, as well as an increase in the distance ventured into the forest to collect grasses not engulfed by Mikania. There was also variation in removal methods (Table 3). Interviewees in Trishuli and Gandaki discussed burning for Mikania management, as well as to promote grassland growth (note in Trishuli and Gandaki the governance committee presidents denied burning; it can be a contentious topic as burning is prohibited in many communities). Cutting and pulling was mentioned in all communities. Only one interviewee (in Koshi) reported seeing Mikania on their farmland, which was very near the community forest fence. Other interviewees strictly reported finding it in the forest and along the forest fence. One interviewee (the governance committee president of Ghaghara) reported a group he organizes to remove Mikania by uprooting it from within the forest and throwing it all into the nearby river. Presence of Mikania and removal methods. The de facto governance relationships (Figure 4) are distinct from the de jure situation (Figure 2). Community forest members are largely isolated in managing Mikania. First we discuss governance relationships generally. We then consider interactions explicitly involving Mikania management and the implications of other relationships for Mikania management outcomes. All community forest members interviewed reported some level of interaction with the buffer zone committee, and many reported indirectly conveying concerns to the national park through buffer zone committee members. The community forest governance committee in each forest communicates with the national park and buffer zone committee about a variety of issues relevant to the community forests. We emphasize several key differences between the cases. First, collaboration and interaction with non-governmental organizations is distinct in each case (non-governmental organization connections include those working with the communities, not only ones related to invasive plants). For instance, in Trishuli, non-governmental organizations are highly integrated, interacting with the governance committee, members, and village development committees (local level government). They provide resources such as toilets and wells, and in some cases skills-based trainings. Gandaki presents the opposite case, as they have little to no integration with non-governmental organizations. Second, the strength of the relationships between different actors and community forest members differs. For instance, community forest members in each case have either direct or indirect connections with the national park. However, the level of trust in the national park is different in each case (Figure 6). 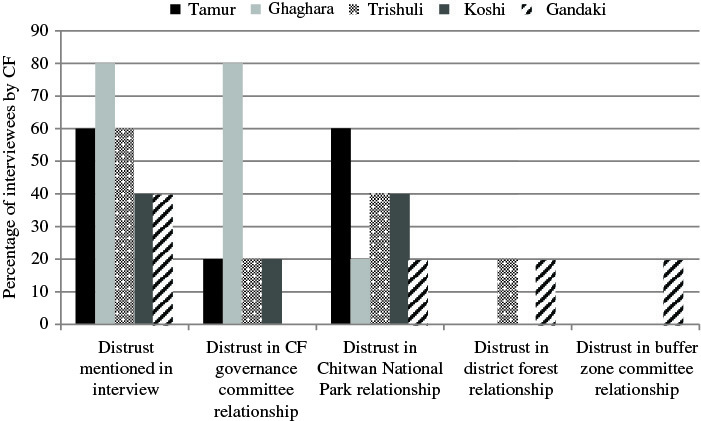 In particular, members of Tamur, Trishuli, and Koshi reported higher levels of distrust in the national park. Trishuli members expressed concern that park officials were corrupt and sequestering monetary resources that could be shared with the buffer zone forests. Ghaghara members expressed lack of trust in their governance committee’s ability to follow through with promises, as well as distrust in park officials. Finally, Gandaki is the only case study with significant ties to the district forest. They are not registered with the district forest, but because of their proximity to a highway and the district forest office, the district forest occasionally communicates with the governance committee members. Characteristics of governance relationships are impacting management. First, members in each case are making Mikania management decisions without consulting their governance committees or other actors, limiting the information available regarding the best ways to successfully remove Mikania (Table 4). In some cases, community members are engaging in removal practices (such as burning) that increase its dispersal (Murphy et al. 2013). The content analysis revealed that community forests with increased numbers of negative interactions (e.g. a community forest member’s request to the park for monetary compensation due to wildlife injury being ignored) are more likely to have members that report distrust and less likely to seek information about management from outside sources. Second, in cases where Mikania is affecting time budgets and daily lives, people expressed that they lacked resources or relationships that could improve the management situation (see the lack of ties and communication in Table 4). Additionally, interviews revealed that there were conflicting perspectives between actors contributing to distrust and influencing information availability. For example, NGO B expressed the opinion that Mikania was not increasing and largely failed to consider community forest members’ opinions regarding Mikania spread and management; this lack of communication negatively impacted the relationship between the members and the organization. Currently, community forest interviewees report no interactions with the NGO as a result. Community forest-level differences in information availability via regular communication with NGOs, Chitwan National Park (CNP), and community forest governance committees (CFGC). Collective efforts to manage invasive species exist in each of the community forests, but to differing degrees. The income of the community forests affects their governance capacity; this amount differs substantially based upon political connections, as well as differing resources and income streams. The buffer zone community forests registered with the national park receive annual funds distributed through the buffer zone committee to individual governance committees; the total amount of money available is impacted by political conditions, which have dramatically changed in recent years (see Karna et al. 2010). Some governance committees supplement this income with tourist entry fees or selling resources like gravel, but their ability to engage in such activities is limited by the condition of the forest and their available resources, resulting in differential income opportunity, and thus governance capacity, across community forests. In Tamur and Ghaghara there were organized efforts to cut and pull Mikania within the forest directly following monsoon season for at least the past five years. Trishuli had “jungle cleaning” groups where specific plants were removed and the forest was cleaned of trash, but they were not centrally organized and were not necessarily targeting Mikania. Koshi and Gandaki did not participate in collective efforts to remove Mikania in the past year. Koshi members previously attempted to cut and pull Mikania, but because forest access is currently restricted there, they are no longer able to organize. Gandaki members reported that their community forest governance committee paid individuals to pull Mikania along the fence, but most community members did not know this. Gandaki also hired people to burn Mikania (this was denied by the governance committee president), but there were fewer voluntary efforts. Collective action was not tightly linked to historical governance capacity, as defined by income and how long the community forest officially existed. Governance capacity has changed in some cases based on income and resources reported from the governance committee presidents and field observations. Collective action related to Mikania removal was assessed as either high, medium, or low based on interviewee reports of and/or participation in such efforts (Table 5). The relationship between governance capacity and collective action. Overall, our methodological approach provided insight into how unanticipated levels of institutional heterogeneity between community forests impacted the management of a common pool resource invaded by Mikania. In Figure 2, we outlined governance relationships in Chitwan community forests de jure, as they formally exist according to official agencies, laws, and policies. However, as our analysis detailed, these relationships look different on the ground. Figure 4 represents the de facto situation, with the relationships as they exist in practice. We discovered that formal relationships were often absent in practice, in part due to practical restrictions like distance (such as the lack of communication between most of our cases and the district forest office), but also because of broken or absent trust between actors. These absent or weakened relationships effectively isolated community members’ Mikania management efforts. The diversity of management behaviors across cases is significant because it highlights that the community forest system in Chitwan has not implemented an effective, best-practice strategy to address Mikania and sometimes continues favor practices that aid in Mikania’s dispersal (Murphy et al. 2013). The current strategy that is thought to be most effective in Mikania removal is time-consuming and involves pulling the plant, immediately bagging it, and burning the bag in a hole. Thus, the different social and ecological conditions in the communities will still necessitate varied efforts to implement the best-practice management strategy. Ostrom (2005) argued that institutional scholars need to understand better the factors that influence institutional heterogeneity, i.e. in our case, why are there differences in norms and strategies surrounding Mikania management efforts? Our analysis of the governance relationships in Chitwan revealed that they influence such differences. Research exploring de jure institutions has made critical and important contributions, but it is also important to understand de facto institutions. Indeed, we argue that investigating both the de jure and de facto situations can create a richer understanding of a given case, leading to more effective solutions in natural resource management that are able to target management weaknesses as they exist in practice. Understanding the de facto institutions is important because in natural resource management efforts, particularly top-down efforts or those implemented by outside actors like NGOs, false assumptions are frequently made about resource users, information, and relationships that exist (Leach et al. 1999). It is likely that understanding the reasons for specific management decisions and the relationships between actors will improve efforts to manage Mikania, as understanding these relationships is the first step towards strengthening them. We present three propositions for addressing common pool resource management, with particular relevance to resources altered by invasive species, an increasingly relevant issue globally (Chornesky et al. 2005). The first two focus on the importance of information access and how institutions impact this, while the third focuses on connections to the natural resource. These propositions are informed by our case studies, but we posit that they provide transferable insight (see Lincoln and Guba 1985) to research with other communities facing related social-ecological challenges. 1) Communities that have more trust-based interaction with non-government organizations and local government actors will have increased access to resource management information, which is likely to increase management success. Our study found that communities that interacted more frequently with NGOs and government actors reported greater access to information on a variety of topics, including farming, construction, and education opportunities. In particular, communities with ties to NGO B had increased access to information about best practices for Mikania management and the management activities in which other communities had engaged. Communities that did not interact with these external organizations, either because they were too far from them or they did not trust them (Figure 6), lacked this information. In essence, these differences in relationships between community forest members and non-governmental organizations produce information asymmetries related to Mikania management and often leave community forest members isolated, with fewer management options and frustrating, unsuccessful removal attempts. Connections to NGOs and other actors are often considered part of social capital (McCarthy 2014); these networks provide improved access to information (Matsaganis and Wilkin 2015). Thus, strengthening the network of relationships between NGOs and communities managing invasive plants is likely to provide information benefits. While increased knowledge does not always lead to increased efforts to implement this knowledge (Finger 1994), communities with knowledge about best practices for invasive plant removal and information regarding others’ efforts begin with an advantage over communities missing this information. Further, in communities that are already actively attempting to manage an invasive plant, new information may be implemented sooner. For instance, community forest members noted they welcomed and needed new management information because their current efforts frequently resulted in Mikania’s return. Due to Nepal’s political climate (currently a very new democracy) and limited resources in mid-level government agencies, it is unlikely that all of the management-relevant relationships absent in the de facto situation could be quickly built or repaired. Thus, to manage Mikania, community forest members need to bolster bottom up collective action. While current district and national level government actors lack resources to significantly aid Mikania management, a combination of bottom up collective action and improved community relationships with actors such as the national park or district forest office could increase the success of bottom up management efforts. Improving the frequency and quality of relationships between community members, NGOs, and government actors is demanding in practice and these relationships depend on the historical and cultural context of the community (Bebbington 2004). In the context of Chitwan, overcoming distrust could begin with an effort from the national park and NGOs to increase the accessibility of their information and services (Agrawal and Gupta 2005). 2) If resource users are struggling to manage common pool resource threats (like invasive species), an absence of valuable management information due to lack of trust between resource users and actors at different scales is potentially a contributing factor and a useful diagnostic starting point. When resource users are struggling to confront threats to their common pool resource, where can stakeholders begin to address the issue? First, stakeholders can begin by confirming that the threat to the resource is an important issue to the local resource users. In our case, we discovered that Mikania is perceived as increasing in all of the community forest groups (Figure 5) and that it is viewed as a key problem in some cases (Table 2). Interviews indicated that the initiative to collectively manage Mikania was present, but that community members’ current efforts had largely been frustrating and unsuccessful, as Mikania typically returned. Additionally, we discovered that distrust inhibited access to relevant management information and resources (Figure 6). Our analysis highlighted the importance of understanding the on the ground situation, as opposed to exclusively studying the de jure situation, as many of the relationships present in the de jure situation were absent or weakened in part due to trust issues. Further, our systematic analysis of interview data lends scientific support to the importance of unpacking trust in common pool resource management, showing that trust can influence heterogeneity in efforts to collectively manage common pool resources. Community forest members’ lack of trust between the national park and/or their governance committee resulted in isolation, where members managed Mikania alone or opted out of management entirely. The precise definition of trust is contentious in literature from a variety of scholarly fields (Heemskerk et al. 2015). Here, trust refers to whether a partner organization or individual can be depended upon, whether they respect the interests of others, and if they are competent in acting upon their agreements (Dirks 1999; Heemskerk et al. 2015). Trust is difficult to quantify and when resource users and managers possess different levels of power, distrust among actors can result when power is abused (Dhiaulhaq et al. 2015). Trust has been found to be central in natural resource management contexts generally, but is not as frequently explored in the context of common pool resources. For example, along with boundary spanning leadership (leadership that connects actors at different levels and of different types), trust has been shown to be vital in successful water management (Edelenbos and van Meerkerk 2015). There are numerous studies exploring techniques to build trust. Berkes (2009) discussed the importance of trust in implementing successful co-management of natural resources and elaborated the vital role that bridging organizations play in cultivating trust between stakeholders. It has also been found that strong leaders (Folke et al. 2005), social learning processes (Henly-Shepard et al. 2015), and the participation of stakeholders can improve stakeholder trust in natural resource management (Reed 2008). In order to strengthen the fairness and effectiveness of natural resources management, it is important both for governments to reach out to local resource users to nurture trust and for local resource users to reciprocate such efforts (Heemskerk et al. 2015). There are fewer examples exploring what happens when trust is entirely lacking in governance relationships and how this influences the social-ecological system. One notable example is Heemskerk et al. (2015), who found that distrust among actors was detrimental in the management of mineral resources in Suriname, where distrust actively impacted natural resource policies and outcomes. Distrust is not only important in shaping policy perceptions but also prohibits communication and information flow among resource users, inhibiting effective natural resource management (Bodin et al. 2006). Trust is important in shaping institutions on the ground, including how institutions are upheld and interpreted. An essential finding is that trust is sometimes deficient between community forest members and their own governance committees (Figure 6). This is important because these committees are not typically viewed as “outsiders,” imposing rules and practices that are viewed as insensitive towards the community they are intended to serve. Instead these management committees have in the past been viewed as working for households and integral to sustainable resource governance. This distrust could in part be a reflection of the lack of ethnic diversity in management committees (committee members primarily belong to the higher socio-economic status Brahmin/Chhetri ethnicity, whereas communities are more diverse). Our current study cannot discern the precise factors promoting distrust between members and governance committees, but it is an important area for future research. Davenport et al. (2006) studied natural resource management and trust in communities located near the Midewin Tallgrass National Prairie in Illinois, United States and detailed the critical importance of trust between the local community and the Forest Service (responsible for the prairie’s administration) in effective management. Although the local communities were not utilizing the prairie for resource extraction, but recreation, the study underscores the importance of identifying and encouraging trust between resource users and the local resource managers for long term success. In Chitwan, members reported less communication with participants they did not trust, which impacted Mikania management information (Figures 4 and 6, Table 4). Well defined institutions in the forms of norms and cognitive structures can strengthen and engender interpersonal trust, as well as trust among different actors and organizations (Fuglsang and Jagd 2015). Importantly, both propositions 1 and 2 argue that institutional norms and relationships are influencing information, and that information matters for successful common pool resource management. By articulating differences in governance relationships and management norms, the reasons for differences in information access become clearer and can be addressed to improve management efforts. 3) Specific to community forests: Community forests that provide more resources to members will exhibit greater potential to collectively manage invasive plants and resources due to greater buy-in/reliance on forest resources. The relationship between governance capacity and collective action is not entirely clear from the literature. Collective action has played a vital role common pool resource management in numerous global contexts (Agrawal 2001; Agrawal 2003; Ostrom 2005, 200) and our research supports that people are more likely to engage in collective action for Mikania management when they are more reliant on the community forest resources. Monetary and social resources have a positive relationship with governance capacity, and as this capacity increases, people may have greater access to a collectively managed resource and incentive to organize to manage it (Coaffee and Healey 2003). Governance capacity and collective action for Mikania management were closely linked in Tamur and Koshi, moderately linked in Ghaghara and Trishuli, and not closely linked in Gandaki (Table 5). Supporting our proposition, in Koshi, the condition of the forest is very poor, the governance committee has little resources, and the members are forced to rely less on these resources. In turn, members reported being less invested in maintaining the forest and organizing for Mikania management. In Tamur, the condition of the forest is better, the governance committee has more income, and members have greater access to fodder collection and fuel wood resources. These members reported annual instances of collective action to both clean the community forest of trash and manage Mikania. Gandaki, the urban community in our study, represents a caveat to part of our proposition. This community forest has a high governance capacity, but a very low level of collective action for Mikania management. This deviation is likely due in part to Gandaki’s urban location; it has very close proximity to a city and a highway. Thus, despite the governance committee’s capacity to maintain the community forest and provide members with access to its resources, the members are less dependent on forest resources as they have a variety of livelihood opportunities available in the nearby city. The perception that Mikania is increasing in all cases (Figure 5), combined with identification of Mikania as a major problem in two cases (Table 2), is an indication that people are aware of and frustrated by its impact on their forest resources. External factors related to the differential income potential available to each governance committee influence a committee’s ability to enhance governance capacity. Committees with fewer monetary resources could begin to enhance the quality of the resource, and the value members receive from membership, by seeking and sharing information on Mikania management best practices. Members that are more reliant on the resources and best able to utilize them are the most likely to participate in collective action to maintain them (Lise 2000). Thus, this may increase collective action potential, reduce Mikania, and simultaneously have benefits for members. Through elucidation of the de facto institutions involved in collective efforts to manage Mikania, these propositions are a useful starting point for understanding how institutions mediate collective action problems involving social-ecological challenges such as invasive species. Understanding institutions is vital to successful common pool resource management (Tang 1991; Ostrom et al. 1994; Becker and Ostrom 1995) and a focus on the de facto situation can potentially aid community members and other stakeholders in designing systems to address issues that prohibit successful management such as lack of trust and information barriers. While institutional research has stressed that there are no one-size-fits-all solutions (Ostrom 2007), our approach can be employed to understand de facto governance relationships in any region to inform management plans that address context specific findings. The propositions presented in this article provide stakeholders a generalizable starting point for addressing institutions and relationships that impact invasive plant management and common pool resource management generally. This study contributes knowledge relevant to our Chitwan case study participants, as well contributing more broadly to an understanding of the complexities involved in managing invasive plants and other disruptive events that threaten social-ecological systems, an increasingly relevant global concern (Chornesky et al. 2005). It is our hope that in the context of Chitwan, this detailed understanding of governance relationships and norms related to management as they exist on the ground will support successful efforts to manage Mikania and other invasive plants. Our key recommendations from this study related to institutional design are to foster norms of trust between actors and implement well-defined management rules. The former has the potential to improve the flow of information pertinent to management decisions (Levin and Cross 2004), while the latter has been shown to improve resource management in many cases (Anderies et al. 2004). One potential way to advance trust and strengthen relationships between resource users and other actors in our case study and beyond is for government actors to address problems viewed as critical by resource users (e.g. in Chitwan, wildlife attacks and flooding). Addressing issues that immediately threaten resource users’ daily experiences may augment community trust in government actors and bolster community efforts to manage invasive species, through freed time and expanded information access, improving the quality of their lives in multiple ways. This research was supported in part by National Science Foundation grant number CNH 1211498. Acharya, K. P (2002). Twenty-Four Years of Community Forestry in Nepal. International Forestry Review 4(2): 149–156. https://doi.org/10.1505/IFOR.4.2.149.17447. Adhikari, B (2005). Poverty, Property Rights and Collective Action: Understanding the Distributive Aspects of Common Property Resource Management. Environment and Development Economics 10(01): 7–31. https://doi.org/10.1017/S1355770X04001755. Agrawal, A (2003). Sustainable Governance of Common-Pool Resources: Context, Methods, and Politics. Annual Review of Anthropology 32: 243–262. https://doi.org/10.1146/annurev.anthro.32.061002.093112. Agrawal, A and Gupta, K (2005). Decentralization and Participation: The Governance of Common Pool Resources in Nepal’s Terai. World Development 33(7): 1101–1114. https://doi.org/10.1016/j.worlddev.2005.04.009. Agrawal, A and Chhatre, A (2006). Explaining Success on the Commons: Community Forest Governance in the Indian Himalaya. World Development 34(1): 149–66. https://doi.org/10.1016/j.worlddev.2005.07.013. Anderies, J. M, Janssen, M. A and Ostrom, E (2004). A Framework to Analyze the Robustness of Social-Ecological Systems from an Institutional Perspective. Ecology and Society 9(1): 18. https://doi.org/10.5751/ES-00610-090118. Baidya, N. G, Bhuju, D. R and Kandel, P (2010). Land Use Change in Buffer Zone of Chitwan National Park, Nepal between 1978 and 1999. Ecoprint: An International Journal of Ecology 16(0) https://doi.org/10.3126/eco.v16i0.3478. Bebbington, A (2004). NGOs and Uneven Development: Geographies of Development Intervention. Progress in Human Geography 28(6): 725–745. https://doi.org/10.1191/0309132504ph516oa. Becker, C. D and Ostrom, E (1995). Human Ecology and Resource Sustainability: The Importance of Institutional Diversity. Annual Review of Ecology and Systematics 26(January): 113–133. https://doi.org/10.1146/annurev.es.26.110195.000553. Behera, B and Engel, S (2006). Institutional Analysis of Evolution of Joint Forest Management in India: A New Institutional Economics Approach. Forest Policy and Economics 8(4): 350–362. https://doi.org/10.1016/j.forpol.2005.08.006. Berkes, F (2009). Evolution of Co-Management: Role of Knowledge Generation, Bridging Organizations and Social Learning. Journal of Environmental Management 90(5): 1692–1702. https://doi.org/10.1016/j.jenvman.2008.12.001. Bernard, H. R (2011). Research Methods in Anthropology Qualitative and Quantitative Approaches. Lanham, MD: AltaMira. Bodin, Ö., Crona, B. and Ernstson, H. (2006). Social Networks in Natural Resource Management: What Is There to Learn from a Structural Perspective. Ecology and Society 11(2): r2. https://doi.org/10.5751/ES-01808-1102r02. Charnley, S and Poe, M. R (2007). Community Forestry in Theory and Practice: Where Are We Now?. Annual Review of Anthropology 36(January): 301–336. https://doi.org/10.1146/annurev.anthro.35.081705.123143. Chornesky, E. A, Bartuska, A. M, Aplet, G. H, Britton, K. O, Cummings-Carlson, J, Davis, F. W, Eskow, J, Gordon, D. R, Gottschalk, K. W, Haack, R. A, Hansen, A. J, Mack, R. N, Rahel, F. J, Shannon, M. A, Wainger, L. A and Wigley, T. B (2005). Science Priorities for Reducing the Threat of Invasive Species to Sustainable Forestry. Bioscience 55(4): 335–348. https://doi.org/10.1641/0006-3568(2005)055[0335:SPFRTT]2.0.CO;2. Clark, M. D, Hall, S. J, Heavenrich, H, Yabiku, S and Dangol, D. R (2016). Evaluating the Effects of Mikania Micrantha on Plant Species Richness and Diversity Throughout Invaded Community Forests in the Buffer Zone of Chitwan National Park, Nepal, Proceedings of the 2016 Annual Meeting of the Ecological Society of America. Coaffee, J and Healey, P (2003). ‘My Voice: My Place’: Tracking Transformations in Urban Governance. Urban Studies 40(10): 1979–1999. https://doi.org/10.1080/0042098032000116077. Davenport, M. A, Leahy, J. E, Anderson, D. H and Jakes, P. J (2007). Building Trust in Natural Resource Management within Local Communities: A Case Study of the Midewin National Tallgrass Prairie. Environmental Management 39(3): 353–368. https://doi.org/10.1007/s00267-006-0016-1. Dhiaulhaq, A, De Bruyn, T and Gritten, D (2015). The Use and Effectiveness of Mediation in Forest and Land Conflict Transformation in Southeast Asia: Case Studies from Cambodia, Indonesia and Thailand. Environmental Science & Policy 45(January): 132–145. https://doi.org/10.1016/j.envsci.2014.10.009. Dirks, K. T (1999). The Effects of Interpersonal Trust on Work Group Performance. Journal of Applied Psychology 84(3): 445. https://doi.org/10.1037/0021-9010.84.3.445. Edelenbos, J and van Meerkerk, I (2015). Connective Capacity in Water Governance Practices: The Meaning of Trust and Boundary Spanning for Integrated Performance. Current Opinion in Environmental Sustainability 12(February): 25–29. https://doi.org/10.1016/j.cosust.2014.08.009. Epanchin-Niell, R. S, Hufford, M. B, Aslan, C. E, Sexton, J. P, Port, J. D and Waring, T. M (2009). Controlling Invasive Species in Complex Social Landscapes. Frontiers in Ecology and the Environment 8(4): 210–216. https://doi.org/10.1890/090029. Finger, M (1994). From Knowledge to Action – Exploring the Relationships Between Environmental Experiences, Learning, and Behavior. Journal of Social Issues 50(3): 141–160. https://doi.org/10.1111/j.1540-4560.1994.tb02424.x. Folke, C, Hahn, T, Olsson, P and Norberg, J (2005). Adaptive Governance of Social-ecological Systems. Annual Review of Environment and Resources 30(1): 441–473. https://doi.org/10.1146/annurev.energy.30.050504.144511. Fuglsang, L and Jagd, S (2015). Making Sense of Institutional Trust in Organizations: Bridging Institutional Context and Trust. Organization 22(1): 23–39. https://doi.org/10.1177/1350508413496577. Gilmour, D (2003). Retrospective and Prospective View of Community Forestry in Nepal. Journal of Forest and Livelihood 2(2): 5–7. Gilmour, D, Malla, Y and Nurse, M (2004). Linkages between Community Forestry and Poverty. Bangkok: Regional Community Forestry Center for Asia and the Pacific, http://www.recoftc.org/site/uploads/content/pdf/Community_forestry_and_poverty_69.pdf. Heemskerk, M, Duijves, C and Pinas, M (2015). Interpersonal and Institutional Distrust as Disabling Factors in Natural Resources Management: Small-Scale Gold Miners and the Government in Suriname. Society & Natural Resources 28(2): 133–148. https://doi.org/10.1080/08941920.2014.929769. Henly-Shepard, S, Gray, S. A and Cox, L. J (2015). The Use of Participatory Modeling to Promote Social Learning and Facilitate Community Disaster Planning. Environmental Science & Policy 45(January): 109–122. https://doi.org/10.1016/j.envsci.2014.10.004. Hufty, M (2011). Investigating Policy Processes: The Governance Analytical Framework (GAF). Research for Sustainable Development: Foundations, Experiences, and Perspectives. Wieseman, V and Hurni, H eds. Bern: NCCR North-South, pp. 403–424. IUCN (2005). Mikania micrantha In: Invasive Species Specialist Group. Global Invasive Species Database, Retrieved from http://www.issg.org/database/species/ecology.asp?si=42. Iversen, V, Chhetry, B, Francis, P, Gurung, M, Kafle, G, Pain, A and Seeley, J (2006). High Value Forests, Hidden Economies and Elite Capture: Evidence from Forest User Groups in Nepal’s Terai. Ecological Economics 58(1): 93–107. https://doi.org/10.1016/j.ecolecon.2005.05.021. Kant, S (2000). A Dynamic Approach to Forest Regimes in Developing Economies. Ecological Economics 32(2): 287–300. https://doi.org/10.1016/S0921-8009(99)00100-7. Karna, B. K, Shivakoti, G. P and Webb, E. L (2010). Resilience of Community Forestry under Conditions of Armed Conflict in Nepal. Environmental Conservation 37(02): 201–209. https://doi.org/10.1017/S0376892910000263. Khadka, N (2010). The Invader that is Strangling an Ecosystem. BBC, March 19, sec. Science & Environment. http://news.bbc.co.uk/2/hi/science/nature/8576646.stm. Lachapelle, P, Smith, P. D and McCool, S. F (2004). Access to Power or Genuine Empowerment? An Analysis of Three Community Forest Groups in Nepal. Human Ecology Review 11(1): 1–12. Leach, M, Scoones, I and Stirling, A (2010). Governing Epidemics in an Age of Complexity: Narratives, Politics and Pathways to Sustainability.. Global Environmental Change, Governance, Complexity and Resilience 20(3): 369–77. https://doi.org/10.1016/j.gloenvcha.2009.11.008. Levin, D. Z and Cross, R (2004). The Strength of Weak Ties You Can Trust: The Mediating Role of Trust in Effective Knowledge Transfer. Management Science 50(11): 1477–1490. https://doi.org/10.1287/mnsc.1030.0136. Lincoln, Y. S and Guba, E. G (1985). Naturalistic Inquiry. 1st edition Beverly Hills, Calif: SAGE Publications. Lise, W (2000). Factors Influencing People’s Participation in Forest Management in India. Ecological Economics 34(3): 379–392. https://doi.org/10.1016/S0921-8009(00)00182-8. MacQueen, K. M, McLellan, E, Kay, K and Milstein, B (1998). Codebook Development for Team-Based Qualitative Analysis. Cultural Anthropology Methods 10(2): 31–36. https://doi.org/10.1177/1525822x980100020301. Matsaganis, M. D and Wilkin, H. A (2015). Communicative Social Capital and Collective Efficacy as Determinants of Access to Health-Enhancing Resources in Residential Communities. Journal of Health Communication 20(4): 377–386. https://doi.org/10.1080/10810730.2014.927037. McCarthy, J. F (2014). Using Community Led Development Approaches to Address Vulnerability after Disaster: Caught in a Sad Romance. Global Environmental Change-Human and Policy Dimensions 27(July): 144–155. https://doi.org/10.1016/j.gloenvcha.2014.05.004. Murphy, S. T, Subedi, N, Jnawali, S. R, Lamichhane, B. R, Upadhyay, G. P, Kock, R and Amin, R (2013). Invasive Mikania in Chitwan National Park, Nepal: The Threat to the Greater One-Horned Rhinoceros Rhinoceros Unicornis and Factors Driving the Invasion. Oryx 47(03): 361–368. https://doi.org/10.1017/S003060531200124X. Nepal, S. K and Weber, K. E (1994). A Buffer Zone for Biodiversity Conservation: Viability of the Concept in Nepal’s Royal Chitwan National Park. Environmental Conservation 21(04): 333–341. https://doi.org/10.1017/S0376892900033646. Ojha, H. R (2006). Techno-Bureaucratic Doxa and Challenges for Deliberative Governance: The Case of Community Forestry Policy and Practice in Nepal.. Policy and Society, Critical Perspectives in Policy Analysis: Discourse, Deliberation and Narration 25(2): 131–175. https://doi.org/10.1016/S1449-4035(06)70077-7. Ojha, H. R, Cameron, J and Kumar, C (2009). Deliberation or Symbolic Violence? The Governance of Community Forestry in Nepal.. Forest Policy and Economics, Discourse and Expertise in Forest and Environmental Governance 11(5–6): 365–374. https://doi.org/10.1016/j.forpol.2008.11.003. Ostrom, E (2007). A Diagnostic Approach for Going beyond Panaceas. Proceedings of the National Academy of Sciences 104(39): 15181–15187. https://doi.org/10.1073/pnas.0702288104. Ostrom, E (2010). Beyond Markets and States: Polycentric Governance of Complex Economic Systems. Transnational Corporations Review 2(2): 1–12. https://doi.org/10.1257/aer.100.3.641. Ostrom, E (2011). Background on the Institutional Analysis and Development Framework. Policy Studies Journal 39(1): 7–27. https://doi.org/10.1111/j.1541-0072.2010.00394.x. Ostrom, E, Gardner, R and Walker, J (1994). Rules, Games, and Common-Pool Resources. Ann Arbor, MI: University of Michigan Press.. https://doi.org/10.3998/mpub.9739. Pandit, R, Dhakal, M and Polyakov, M (2015). Valuing Access to Protected Areas in Nepal: The Case of Chitwan National Park. Tourism Management 50(October): 1–12. https://doi.org/10.1016/j.tourman.2014.12.017. Poteete, A. R and Ostrom, E (2004). Heterogeneity, Group Size and Collective Action: The Role of Institutions in Forest Management. Development and Change 35(3): 435–461. https://doi.org/10.1111/j.1467-7660.2004.00360.x. Rai, R. K and Scarborough, H (2015). Understanding the Effects of the Invasive Plants on Rural Forest-dependent Communities. Small-scale Forestry 14(1): 59–72. https://doi.org/10.1007/s11842-014-9273-7. Ram, A. K (2008). Impact of Mikania Micrantha on Rhinoceros Habitat in Chitwan National Park, Chitwan Nepal. Pokhara: Tribhuvan University, Institute of Forestry.. http://www.forestrynepal.org/images/thesis/Mikania%20final%20report%20Ashok%20Ram.pdf. Reed, M. S (2008). Stakeholder Participation for Environmental Management: A Literature Review. Biological Conservation 141(10): 2417–2431. https://doi.org/10.1016/j.biocon.2008.07.014. Straede, S and Helles, F (2000). Park-People Conflict Resolution in Royal Chitwan National Park, Nepal: Buying Time at High Cost?. Environmental Conservation null(04): 368–381. https://doi.org/10.1017/S0376892900000424. Straede, S and Treue, T (2006). Beyond Buffer Zone Protection: A Comparative Study of Park and Buffer Zone Products’ Importance to Villagers Living inside Royal Chitwan National Park and to Villagers Living in its Buffer Zone. Journal of Environmental Management 78(3): 251–267. https://doi.org/10.1016/j.jenvman.2005.03.017. Tang, S. Y (1991). Institutional Arrangements and the Management of Common-Pool Resources. Public Administration Review 51(1): 42–51. https://doi.org/10.2307/976635. Varughese, G and Ostrom, E (2001). The Contested Role of Heterogeneity in Collective Action: Some Evidence from Community Forestry in Nepal. World Development 29(5): 747–765. https://doi.org/10.1016/S0305-750X(01)00012-2. Young, O. R, Berkhout, F, Gallopin, G. C, Janssen, M. A, Ostrom, E and van der Leeuw, S (2006). The Globalization of Socio-ecological Systems: An Agenda for Scientific Research. Global Environmental Change 16(3): 304–316. https://doi.org/10.1016/j.gloenvcha.2006.03.004.